This article was written by Gleaming Glass to give you some window cleaning tulsa easter gift ideas. Easter is right around the corner, next weekend in fact. You might not feel the pressure to buy gifts for family and friends and loved ones like you do around Christmas time but he Easter can still be a time to show the ones in your life you love how much you really love them and care about them. If you’re in the Tulsa area wondering what to buy your love ones for Easter have you thought about giving them the gift of clean windows. Think about the last time you were over at your parents house. Or maybe go a little bit further, think about the last time you were at your mother-in-law or father-in-law’s house. Do you remember what their Windows looks like? Did you notice that they were dirty? Why not give them the gifts you clean windows in Tulsa. Nothing says I love you to your mother and father father-in-law like the gift of clean windows. Every time they look out their windows will be thinking about how great of a son-in-law or daughter In law that they have. If you’re a woman in Tulsa, think about the last time you’re over at a friend’s house for coffee or Bible devotions or a book study group. Was your best friend embarrassed about how the windows look? Will why not buy them clean windows. It’s not the first thing everyone thinks about when they think about buying a friend or loved one a gift, but it really is a great gift. Last year, just before Christmas time one of my customers bought their father Tulsa window cleaning services from gleaming glass. Her father was incredibly happy about our window cleaning tulsa easter services and so was the daughter that bought it for him. In fact, here’s what her husband had to say: ““My wife and I saw the windows after dinner, and they were impressive, they looked brand new. My father-in-law and his wife were both pleased with your meticulous work beyond description. You definitely exceeded their expectations. In addition, they both said they enjoyed your company. Thank you for all your good work!” – Alan Finley” now you have no excuse for buying your loved ones and friends the gift of window cleaning Tulsa. I have given you concrete proof that someone else enjoyed the window cleaning tulsa easter service as a gift for Christmas. It’s not exactly something you can wrap it in a box and put under the tree, but if you’re really wanting something physical to put under the tree you can just email us at garrett@gleaming.glass and I can throw together a gift certificate to print off and you can hand them for Easter or Christmas. This article kind of transition from Easter gifts to Christmas gifts I realize that a little too late there’s no going back. So I’m making this into a hodgepodge of Christmas an Easter gift ideas. I’ll make a separate post later about giving window cleaning services as a gift for Christmas but this one is is directed more at Easter window cleaning gift giving. Here’s a crazy idea of a way to give window cleaning as gift for Easter: Take a bunch of those plastic Easter eggs and just fill them with Dawn dish soap and throw them all over blonde of the Owasso and her friend you’re going to be giving Tulsa window cleaning services from gleaming glass to. When they open the plastic eggs their hands will be covered and Dawn dish soap and they will wonder what in the world the meaning of this gift is. That’s what when you come in with the punchline! I’m not giving you don’t dish soap as a gift for Easter, that was just my stupid silly way of saying that I’m giving you window cleaning services as a gift for Easter. I’m sure window cleaning tulsa easter services in Tulsa somehow relate to Easter. It could be that Jesus died on the cross so that all sinners had a chance at getting to heaven. And if you didn’t know, Heaven is a place where windows are consistently clean. Besides God the Father, Jesus Christ the Son, and the Holy Spirit being there, there is really no difference between Heaven and Earth other than eternally clean windows. Unfortunately, the windows here on Earth have a sinful nature so they have a tendency to get dirtier and dirtier. The windows in Heaven however have glorified bodies so they remain clean for all of eternity. It helps that there are no lawn mowing crews, painting companies, or window art companies in heaven. Those are also huge contributing factors to the windows remaining eternally clean. You just never know what you might learn on a Gleaming Glass blog post about window cleaning tulsa easter services and Easter. I bet you never thought the only difference between Heaven and Earth are eternally clean windows, But it turns out that’s actually a proven fact, that we can’t prove or have any evidence of. So just take it at face value and believe whatever it is you want to believe. But, this is what we’re believing you’re sticking to it. Rumor has it, that in addition to being a carpenter, Jesus was also a window cleaner. He was a lot more efficient than I am you’re at cleaning glass window cleaning Tulsa seeing he could just walk from window to window and just stare down the window until it turned cleaned. Now I don’t know if you have to be the Son of God in order to have that ability, or it could be that Jesus just worked on it every day and put in 10,000 hours of practice in order to truly realize his potential as a window cleaner, but I hope to someday acquire the same skill. If not on this Earth and there’s life, maybe in the next. It would really make my job marketing gleaming glass window cleaning Tulsa company easy. I could just simply say gleaming glass, we clean windows like Jesus. People would be beating down a path to get to our door and hire us to clean their windows in Tulsa. Obviously, we are the best window cleaning company in Tulsa to choose to buy window cleaning services as a gift for your Tulsa friends. We can’t back up this claim with a guarantee or warranty, but we can say that we hope Jesus shows up with us at the job whenever we show up to clean your windows. Again, I can’t confirm that seeing that Jesus is currently sitting at the right hand of God in heaven, but I would just like to throw that out there as a bonus to our normal window cleaning services. The bonus is simply this: A slim possibility that Jesus could show up and clean your windows by tearing them down until they turn clean. Tulsa window cleaning clean, that is. Jesus style baby! Below is an actual pic taken at a home in Tulsa where Jesus was performing window cleaning Tulsa services. 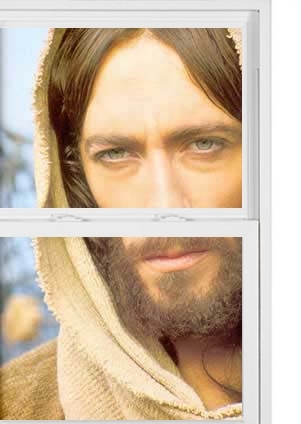 It is allegedly a real picture taken of Jesus staring down a window until it turned clean…allegedly.